Sister ship to the Corsica Marina, the Sardinia Vera ferry can carry up to 1500 passengers and 550 vehicles. 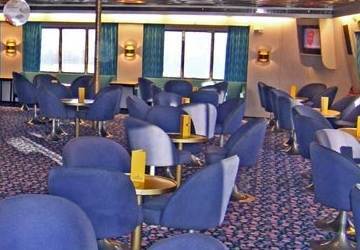 Onboard you’ll find a self-service restaurant, cafeteria, bar, shop, children’s play area and a solarium. Please Note: Whilst we have taken great care in making our Sardinia Vera guide as accurate as possible, onboard facilities, services and entertainment may vary depending on the date and time of year that you travel, facilities mentioned may change without notification and ferry companies reserve the right to operate vessels other than those mentioned at time of booking without prior notification. Punctual ferry, clean and with a good quality/price. We had a smooth crossing of four hours, the boat departed and arrived as scheduled, boarding went smoothly, helping us to ride on board without damage because we have a sports car, very service oriented. 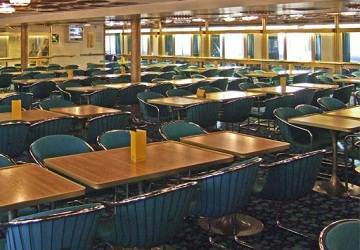 The ships are also good, we spent the outbound on relaxing beach chairs in the shade on the deck, On the way back, we stayed in the bar in the lounge chairs. Completely fine and not expensive. First time with Direct Ferries: really positive result. It takes a ridiculously long time to drive on the ferry and almost an hour before you get off. Very inefficient. It's extra annoying when the ferry is also 30 min late. Apart from that it's nice on the boat, good opportunities to eat and to sit down outside. The air conditioner was too low for us. Apart from that we are really satisfied. 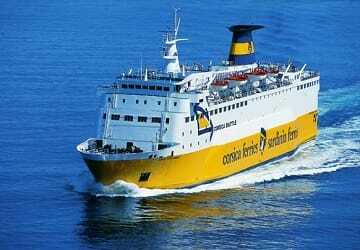 "return Golfo Aranci-Livorno with Sardinia Express"
We booked with DirectFerries the crossing Livorno-Bastia and return. Departure on time, comfortable seats. corsica sardinia ferries always on time. Clean and big cabins. Too busy on the outbound but on summer it's normal . They should offer more seats outside, so everyone can enjoy the sun during the crossing. We travelled with Corsica Sardinia Ferries (Sardinia Vera). Everything good, we had a good coffee and crepes with chocolate on board. "a journey to Sardinia in 2014"
I made a crossing from Golfo Aranci to Livorno with directferries. The booking was quick, easy and cheap. It’s a pity that we don’t get the tickets directly, but that we need to collect them at the porte. In some cases, this can cause an inconvenience. very good service from the members of staff, the ferry was clean and punctual. Excellent journey, punctual, the cabins were really clean, the staff were kind and helpful.. Good value for money I recommend it..
Everything was to the satisfaction of and everything was fine with no problems.